Archdeacon Euplius was arrested for owning, reading and preaching from a copy of the Bible during the Diocletian persecution. 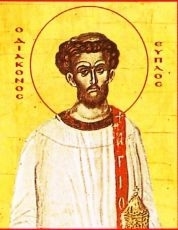 Always carrying the Gospel with him, St Euplius preached constantly about Christ. He was arrested and brought before the local governor who asked him to read extracts from the book. He was then imprisoned and tortured. When they led Euplius to his execution his Gospel was hung around his neck. Having asked for time for prayer, the archdeacon began to read and explain the Gospel to the people present. Euplius was executed. His name in Greek means "good sailing".